Crystal Exchange America is an online store with reputable Swarovski dealers featuring discontinued, retired, and rare Swarovski. It is always exciting for the dealer and client when hard-to-find figurines, like this pink duck, are located for avid collectors. 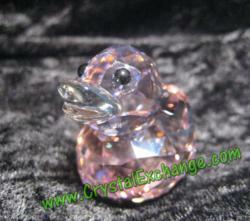 Crystal Exchange America is delighted to conclude a sale on a hard-to-find Swarovski pink duck for our crystal fanatics clients. Crystal Exchange America is delighted for several of their crystal fanatics clients that they were able to conclude a sale on a hard-to-find Swarovski figurine. The figurine sold was a Swarovski limited edition pink duck. The limited edition pink duck is included in the “Happy Ducks” series by Swarovski. However, this Swarovski Happy Duck is unique, and quite a challenge to find. This pink duck was available only in Japan. It was produced to raise funds and awareness for the “Kids Earth Fund”. It was found for a very short time in October, 2010. The Kids Earth Fund Happy Duck is nearly identical to the Swarovski limited edition Pink Ribbon Happy Duck. While the Pink Ribbon Happy Duck was also not available in the USA, it is easier to find. The difference between the two pink ducks is that the Pink Ribbon Happy Duck, done to promote awareness and raise funds, is also adorned with the familiar breast cancer ribbon. For identification purposes, it is worth mentioning that both crystal Pink Happy ducks are assigned the exact same Swarovski 10-digit part number. However, they are assigned different 7-digit system numbers. For this reason, Swarovski crystal collectors will want to make sure that the system number on the box label is legible to ensure that a duck minus the breast cancer ribbon is indeed the Kids Earth Fund duck with original packaging. For comparisons in value of the two pink ducks, the Pink Ribbon Happy Duck generally sells in the price range of $100 - $200. The Kids Earth Fund Happy Duck sold for nearly $700! Crystal Exchange America can be found by visiting their website which has been online for over 15 years... a testament to their quality and success in the crystal industry. Presently, they have over 5000 Swarovski figurines in their online store, most of which is retired Swarovski. For the avid Swarovski crystal collector looking for more than the retired figurines, Crystal Exchange America also sells the most popular books on Swarovski Crystal. 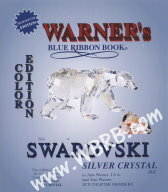 Two of the collectors’ favorite Swarovski price guides are written and published by Swarovski collectors for the past eighteen consecutive years: Warner’s Blue Ribbon Books on Swarovski. 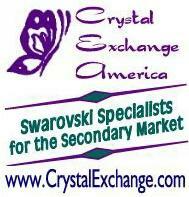 Crystal Exchange America, a retired Swarovski dealer, is not affiliated with, endorsed, or sponsored by Swarovski. Crystal Exchange America is an independent company providing a specialist service to collectors of Swarovski Crystal and Swarovski Silver Crystal.